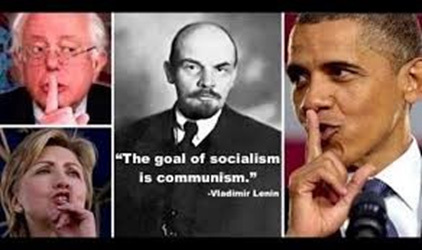 "No cause ever in the history of all mankind, has produced more cold-blooded tyrants, more slaughtered innocents, and more orphans than socialism with power. It surpassed, exponentially, all other systems of production in turning out the dead." The term Communism was initially coined by the French philosopher and writer Victor d'Hupay (1746–1818), specifically in his book: "Projet de communauté philosophe" (1777), which emphasizes the basis of life as being a "commune" (large gathering of peoples sharing a common lifestyle and role in society). In his book, d'Hupay advocates for people to "share all economic and material products between inhabitants of the commune, so that all may benefit from everybody's work," essentially promoting a classless egalitarian society where the concept of property is null and void. D'Hupay's work would help inspire future generations toward developing the modern day understanding of Communism as a political ideology. Another contributor to this was prominent English author, philosopher and Renaissance Humanist Sir Thomas More (1478 -1535), who in his magnum opus "Utopia" (1516), advocated for society to adopt a system of common ownership of property, governed by a select group of rulers trusted to administer the process of mutual sharing in a reasonable fashion. It is noted by author Eduard Bernstein in his 1895 work, "Cromwell and Communism", that there existed several groups that proposed the abolition of private property and ownership in English society, to which Oliver Cromwell (1599-1658) responded with harsh rebuke and exile of these groups, during his time as the Lord Protector of the United Kingdom. My father, Professor Ellis Washington, also did a series of essays on utopian writers through the centuries including Sir Thomas More titled – Utopia, Eugenics and today's Progressives. The French would however have a completely divergent response to dissenters of private ownership as best exemplified during the bloody French Revolution (1789-1799), with the destructive seeds of Communism, Socialism, and Liberalism being supplanted by the ideas of such famous Enlightenment scholars as Jean Jacques Rousseau (1712-1788). In its modern form, Communism grew out of the socialist humanist movement in 19th-century Europe, spurred by the perceived inhumanities against the lower-classes affected by the First Industrial Revolution (1760-1840). Socialist critics, most notably: Karl Marx (1818-1883) and Friedrich Engels (1820-1895), would craft the philosophy of Marxism, which blamed the miseries of the Proletariat (urban factory worker) on Capitalism and those who operated the factories and expanded capitalist influence, the Bourgeoisie. In 1848, Marx and Engels expanded upon their radical Socialist ideology in refurbishing the definition of Communism for the 19th century, popularizing the term in their famous pamphlet, The Communist Manifesto (1848). Marx and Engels' work would move on to inspire the emergence of Communism as a weaponized operating system of governance in the Soviet Union in the early 20th Century, inspiring the emergence of the Bolshevik Revolution (1917), producing the bloodiest Holocaust in modern History which amounted to the loss of nearly 100 million lives. This article seeks to expose the devastating repercussions of Communism in countries that have suffered horribly from its implementation and dictatorial enforcement, including: Russia, China, Cambodia, North Korea, Cuba, and Venezuela. 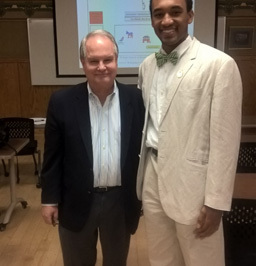 This article will examine the teachings of the Victims of Communism Memorial Foundation, exemplified through the lecture at Clemson University of Mr. George Harbison, who regularly lectures on behalf of the Foundation to colleges across the U.S in order to warn against and inform students and faculty about the dark history of Socialism and Communism often untaught in America's institutions of higher learning. This article is also largely inspired by my father, Professor Ellis Washington's current article series exposing the evils of Bolshevism in America. Mr. George Harbison, a seasoned financial executive and political commentator, whose ideas on tax reduction have challenged those of prominent businessmen like Warren Buffet, and tax assertions that have been published in Forbes Magazine and in other business publications. Mr. Harbison is a representative of the Victims of Communism Memorial Foundation, a non-profit organization established in 1994, which according to their website, is "devoted to commemorating the more than 100 million victims of communism around the world and to the freedom of those still living under totalitarian regimes." 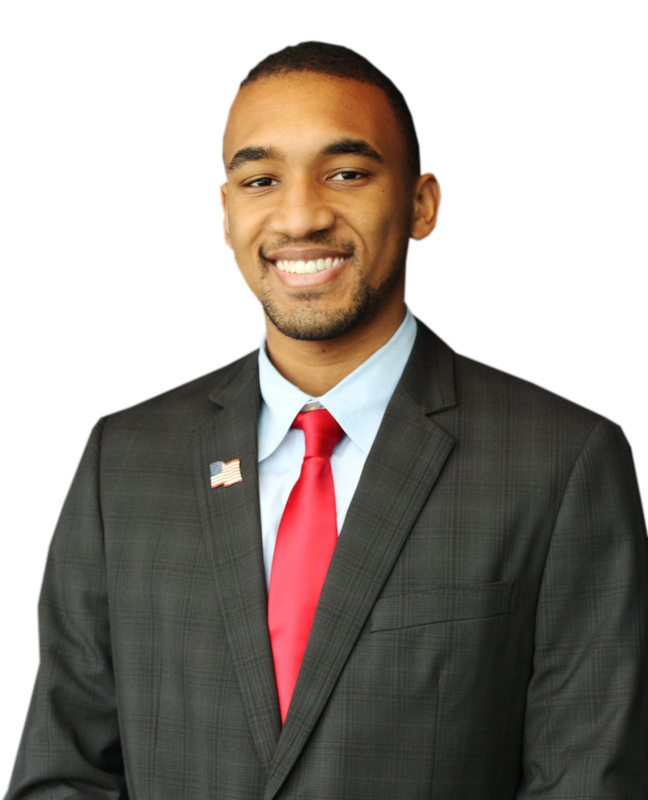 Mr. Harbison would deliver his lecture at my school, Clemson University, on Monday October 2nd 2017, hosted by the YAF (Young American's For Freedom), of which I am a member. I would help YAF in preparing and spreading the word for Mr. Harbison's speech, which proved to be a remarkable success with nearly 100 students and faculty packing the classroom where he spoke. In his speech, Harbison would provide some of the most grotesque statistics of genocide, democide and politicide in dozens of countries affected by Communist regimes during the 20th century and even today. This lecture could not be any more significant to hear 100 years after the emergence of Bolshevism which to this day affected nations like – China, North Korea, and Venezuela who continue to perpetuate variations of Communistic authoritarian regimes responsible for subjugating the masses, destroying individual freedoms, violating property rights, and in many cases crippling the host country's economy. "No cause, ever, in the history of all mankind, has produced more cold-blooded tyrants, more slaughtered innocents, and more orphans than socialism with power. It surpassed, exponentially, all other systems of production in turning out the dead. The bodies are all around us. And here is the problem: No one talks about them. No one honors them. No one does penance for them. No one has committed suicide for having been an apologist for those who did this to them. No one pays for them. No one is hunted down to account for them. It is exactly what Solzhenitsyn foresaw in The Gulag Archipelago: "No, no one would have to answer. No one would be looked into." It will not happen. The pathology of Western intellectuals has committed them to an adversarial relationship with the culture – free markets and individual rights – that has produced the greatest alleviation of suffering; the greatest liberation from want, ignorance, and superstition; and the greatest increase of bounty and opportunity in the history of all human life. This pathology allows Western intellectuals to step around the Everest of bodies of the victims of Communism without a tear, a scruple, a regret, an act of contrition, or a reevaluation of self, soul, and mind." MR. HARBISON: "Soviet Communism based on the collectivist philosophies espoused by Karl Marx and Friedreich Engels took hold in Russia after the October Revolution of 1917, led by Vladimir Lenin, a vicious and ruthless ideologue, the victorious Bolsheviks set forth to fundamentally change Russia based upon Marx's utopian vision of society. Lenin and his fellow Communists nationalized industries, seized private land and property from their owners and redistributed this property to peasants. Religion was officially eliminated from Russian society, as Russians were forced by gunpoint to worship the power of the state. In order to firmly establish his new ideology, Lenin resorted to a campaign of mass murder of his political opponents in a purge now referred to as the 'Red Terror.' 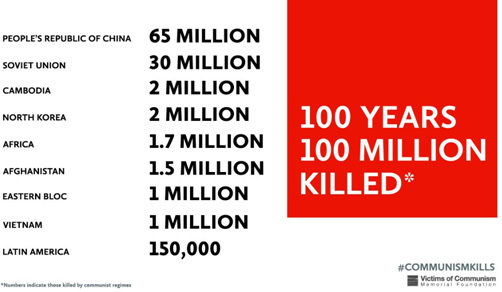 It is estimated that an upward of 1.5 million people were murdered in this brutal campaign. 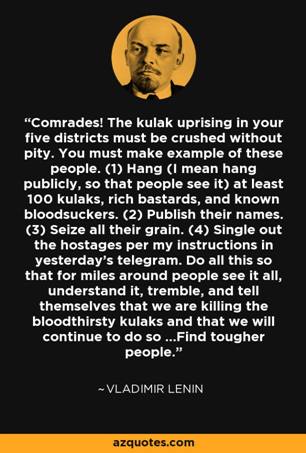 Lenin personally sent the orders to introduce terror and kill those who resisted the Communist takeover of Russia. This telegram is an example,"
MR. HARBISON: "As vicious as Lenin was, his successor as Secretary General, Joseph Stalin, was even worse. Stalin ordered the forced collectivization of Soviet agriculture in an attempt to focus more resources on the task of Industrialization. Under collectivization, peasants were forbidden to eat even their own crops, which were deemed Socialist property. Under collectivization, economic incentives to produce food were eliminated in favor of rigged state control, that resulted in an inevitable upheaval in agriculture brought about by the lack of incentives, lead to the catastrophic Soviet famine of 1932-33, known as the Holodomor ("to kill by starvation"). Roughly 8 million people starved to death. From 1936-1938, in an attempt to consolidate and strengthen his power, Stalin conducted the Great Purge, also called the Great Terror. Unlike the previous Communists mass murders carried out in the countryside, the Great Purge was primarily directed at Communist Party members, Government officials, and Red Army leadership. In this reign of terror, hundreds of thousands of victims were accused of various political crimes, including: espionage, sabotage, anti-Soviet agitation, and conspiracies to conduct coups. Those accused were either summarily executed by shooting, or sent to the labor camps. According to declassified Soviet archives, during 1937 and 1938 alone, the Soviets Secret Police detained over 1.5 million people, of whom almost 700,000 were shot. Western scholars estimate that the actual number murdered was nearly twice this number. Stalin also presided over the vast expansion of the Soviet gulag system, the infamous forced labor and reeducation camps run by the Communist regime. The gulag had a total inmate population of about 100,000 in the late 1920s when it underwent an enormous expansion coinciding with Stalin's collectivization of agriculture. By 1936 the gulag held roughly 5 million prisoners, a number that was probably equal or exceeded every subsequent year until Stalin died in 1953. Political prisoners consisted of resistant peasants arrested during collectivization, purge Communist Party members, and military officers suspected, the tours of traitors, and dissident intellectuals. Alexander Solzhenitsyn (1918-2008), perhaps the gulag's most famous inmate, claimed that between 1928 and 1953, some 40-50 million people served long sentences in the archipelago. Figures supposedly compiled by gulag administration itself, released by Soviet Historians in 1989, indicate that a total of 10 million people were sent to the camps from 1934-1947. Gulag prisoners lived under the threat of starvation or execution if they refused to work. It is estimated that as result of long working hours, harsh climatic working condition, inadequate food, and summary executions, at least 10% of the gulag's total prisoner population died each year. 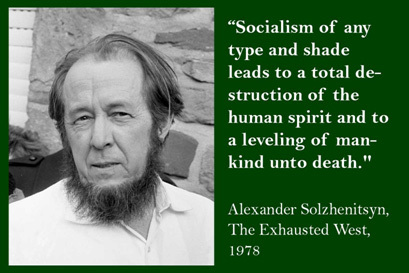 Solzhenitsyn said,"
'The Black Book of Communism', the authoritative reference source for the deadly statistics of Communism, conservatively estimates that Soviet Communism lead to the deaths of 20 million human beings. To put this in perspective, 20 million is roughly the entire current population of the state of New York. The magnitude of horror, death, and destruction brought about by Vladimir Lenin and Joseph Stalin, as they ruthlessly imposed Communism upon Russia and the Soviet Union is beyond human comprehension. MR. HARBISON: "As bad as the Russian people suffered under these two monsters, the Chinese people's descent into the Hell of Communism was far worst. Mao Zedong was the greatest mass-murder of the 20th Century. In 1949, as chairman of the Communist Party of China, Mao proclaimed the foundation of the People's Republic of China. He then sent forth to impose his version of Marxism on the Chinese people. He lead the People's Republic of China until his death in 1976. Mao employed a familiar playbook in imposing Socialism in China. The Great Leap Forward launched by Mao in 1957, brought with it the forced collectivization of China's agricultural sector, in an attempt to accelerate the growth of the country's industrial sector. Not surprisingly, its appropriation of private farms, and with it, its elimination of economic incentives to produce food led to famine and mass starvation. It is estimated that deaths from hunger alone reached more than 50% in some Chinese villages, and ultimately 30-40 million Chinese peasants perished, roughly the entire current population of California. In the mid-1960s, Mao came to the conclusion that current Communist Chinese leadership was moving too far in revisionist, less ideologically pure direction. In response, in August 1966, Mao launched a cultural revolution. Schools were shut down and Mao called for a massive youth movement to act against Communist Party leaders for their embrace of bourgeoise values and lack of revolutionary spirit. Soon student military groups called the Red Guard were formed and they attacked and harassed members of China's elderly and intellectual population. How ironic it is that the intellectual class was the target of Mao's bloodthirsty student brigades. Professors had their faces smeared with ink, were forced to get down on all fours and bark like dogs. Many were beaten to death and some were eaten after being murdered. 'The Black Book of Communism' estimates that Chinese Communism lead to the death of 65 million people. That's the equivalent of the combined population of California and Texas, the United States two most populous states. Think about that, everyone living in Los Angeles, San Francisco, San Diego, Houston, Dallas, plus so many, many more...dead." MR. HARBISON: "Perhaps no other country had suffered more at the hands of its Communist masters than Cambodia. Pol Pot's murderous Kampuchea seized control of Cambodia in 1976, and they then set out to impose Communism on the Cambodian people. The country suffered horribly under the Communist oppression until Pol Pot was ousted in 1979. Highly xenophobic, Pol Pot set about to completely isolate the country from outside influences and to completely establish the collectivist radically agrarian society. To accomplish this, the regime closed all the country's schools, hospitals, banks, and factories. Religion was outlawed and all private property was confiscated. Most citizens in urban areas were forcibly relocated from their homes to work on collective farms. The Kampuchea told these residents they would be moved only a short distance from home and that they would return after only a few days. People who refused to evacuate were killed on the spot and their homes burned to the ground. The evacuees were instead sent on long marches to the collectives, during which tens of thousands of children, the elderly, and the sick died in these brutal death marches. Inevitably, the elimination of economic incentives to grow food, coupled with a total lack of agricultural knowledge by the former city dwellers lead to a horrific famine. Although deaths from starvation were widespread, acts seen as picking wild fruit or berries were seen as private enterprise by the Kampuchea, and were punishable by death. Commercial fishing was banned, resulting in a loss of a primary food source for millions of Cambodians, 80% of whom relied on fish as their only source of animal protein. To make way for Pol Pot's vision of an agrarian utopia, money was abolished, books were burned, and most of the country's teachers, merchants, and intellectual elite were murdered, as they were viewed as potential enemies of the state. One need only be seen wearing eyeglasses to be branded as an intellectual and shot. Of course, in congruence with standard Communist protocol, all religion was banned. Anyone seen taking part in religious activities or services, was summarily executed. Thousands of Buddhists, Muslims, and Christians were murdered simply for exercising their religious beliefs. Pol Pot and his Kampuchea brigades took power in Cambodia in order to create an agrarian Communist utopia. Inevitably and tragically the experiment ended just like every other experiment in Socialism... a dreadful deadly disaster. 'The Black Book of Communism' estimates that Cambodian Communism lead to the deaths of 2 million people, roughly 25% of the country's population. That's roughly the entire population of Chicago Illinois." Truly there is much to be learned from the horrific and disturbing loss of human life caused by the many Communist and Socialist regimes across the world. Mr. Harbison's lecture paints a vividly mortifying picture of Communism's indescribable repercussions on the many poor souls that suffered under the tyrannical regimes of Lenin, Pol Pot, Stalin, Mao, and other maniacal rulers throughout the 20th century. Yet if this is the case, why does Communism still exist today? With the collapse of the Soviet Union on December 26th 1991, why do the remnants of Socialism still permeate countries like North Korea, China, and Venezuela, where the citizens of each country are governed by laws of collectivization and mutual misery under the rule of the elite? Hasn't civilization learned from the gross error of Communism and the murderous imprint it has left upon the pages of History, literally written with the blood of the lives of over 100 million people sacrificed to perpetuate this failed and evil system of governance? Mr. Harbison and myself after the lecture at my school of Clemson University, Monday October 14th, 2017. All people are obligated to speak out against the global terrors of Socialism in its modern existence. With countries like Venezuela lacking once abundant resources as: gasoline, oil, and other government regulated products such as milk, various types of meat, coffee, and rice vital to the nation's survival, the infant mortality rate to grow by 65% in the past year alone. Under President Nicolás Maduro, Venezuela suffers a lack of resources amid continual drought and famine, while thousands protest in the streets daily to end his authoritarian regime strangling the economic growth of the nation. North Korea is perhaps the most talked about Socialist regime today, with its constant threats against the United States and others concerning stricter sanctions upon its tested launching of multiple ICBMs (intercontinental ballistic missiles) and various bombs. Under brutal dictator Kim Jong Un, like all other Communist nations state prior, religion is abolished and during 1994-1998 the country experienced a major famine resulting in the deaths of between 240,000 and 420,000 people, with the nation still struggling to produce an adequate amount of food. 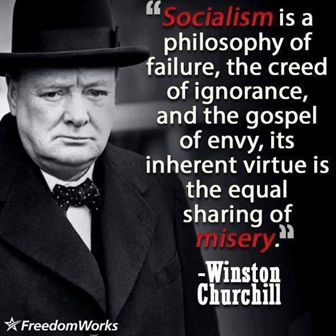 And in America, millions of Democrat and Independent voters supported the campaign of an outspoken Socialist Democrat, Senator Bernie Sanders, who was praised for being a revolutionary figure against the Democratic establishment, despite advocating for more extremist Socialized policies than many of his colleagues in the Left, such as: universal socialized healthcare, free education, and redistribution of wealth inequality, all at the tax payers' expense (no such thing as a free lunch). These are but a few remnants of Socialist vestiges that continue to exist World-wide, all linked to the earliest emergence of Communism as a movement during the bloody Bolshevik Revolution in 1917. 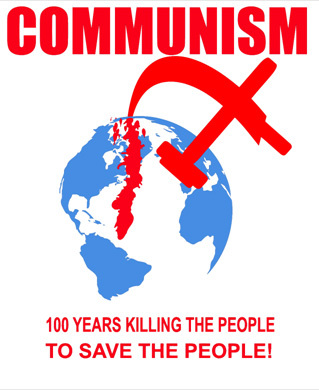 Yet, after 100 years of death, imprisonment, torture, starvation, and mutual suffering, what have we learned from Communism as an evil murderous ideology? And how much longer must its legacy live on for today? National emergency: Building the case for "The Great Wall of Trump"